Feet hold the body up, so don’t draw them too small on your fashion figure drawings — the length of your foot is about the length of your forearm, from the crease of your elbow to the start of your wrist. You can draw feet from many angles, but concentrate on the front and side views for now. Start your feet by drawing a hoof (as in animal) shape — don’t laugh, it works! Lightly draw the outline of a hoof shape. 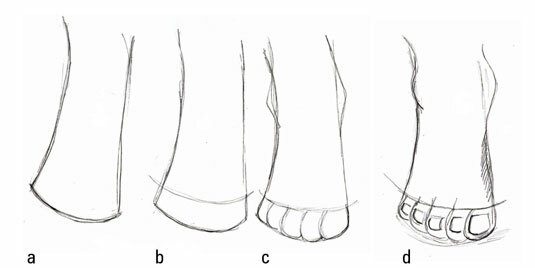 Inside the hoof shape, lightly draw a curve that follows the line of the front of the foot. This line marks where the toes join the foot and determines how long the toes are. Divide the space between the two lines into five toes, starting with the big toe, and sketch in the anklebones. The anklebones are just slight triangle pieces coming out from each side — the anklebone on the inside of the leg is a little higher than the one on the outside. These bones work the same way on the both the right and left foot. Draw in the toenails using curved lines and add shading by the arch of the foot and below the toes. Draw a right triangle (about the length of a head) and round out the points. Curve the right angle of the triangle to form a heel. Continue along the bottom of the triangle with a curved line for the bottom of the foot. Curve the line up at about the midpoint of the triangle to form the arch of the foot. Then make a smaller indentation toward the front of the triangle to show where the big toe begins. To complete the top of the foot, draw a curved line along the front of the triangle from the ankle to the toe. Finish the foot by penciling in a toenail, the anklebone, and a little shading.